NORTH ATTLEBORO, Mass. – In a showdown between two of the Hockomock League’s top pitchers, North Attleboro’s Bella Erti and Stoughton’s Nicole Baker both delivered. Erti, a junior, allowed just one run on four hits and one walk, striking out 13 in the circle for the Rocketeers. Baker, a sophomore, was also strong with just two runs (one earned) allowed on three hits, no walks, and 11 strikeouts, including 10 swinging. A game with two great pitchers is likely to come down to one or two plays, and that’s exactly what happened. Stoughton took the lead in the top of the fourth inning, but the Rocketeers answered with two runs in the bottom half of the inning. And then erased the tying run at the plate in the top of the sixth on a nice defensive play by North Attleboro junior catcher Ashley Cangiano. “It was nice to respond,” said North Attleboro head coach Bill Wallace. “We’re still a young team, we had four girls that it was their first varsity start. Having said that, they know the game. We knew that we’d have to put the ball in play. Both pitchers had it going early on. Bella retired the first nine Stoughton batters in order, six by strikeout. Baker allowed just two base runners to start, one on an error in the first and Katie Daby’s leadoff single in the second. But neither runner advances past second and Baker had seven strikeouts through three. The offenses for both teams came alive in the fourth inning. Stoughton senior Jordan Lyons sliced a one-out triple over the right fielder’s head. Two batters later, junior Lexi Baptista hit a hard grounder through the right side for a two-out RBI and a 1-0 lead for the visiting Black Knights. Stoughton’s Bri Ferrandiz followed with a single up the middle to put runners on first and second but Erti bounced back with a three-pitch strikeout to escape further damage. North Attleboro had an immediate response in the bottom half of the fourth. Cangiano led off with a single up the middle. Annabelle Hebard followed with a bunt up the third base line. The ball was bobbled into foul territory, and Cangiano hustled to an open third base, which allowed Hebard to take second. Daby hit a soft grounder up the middle but the throw to first was high and both Cangiano and Hebard came home safely. Stoughton freshman Sydney Menz made a terrific catch in right and doubled the runner at second to help the Black Knights keep the deficit at one. 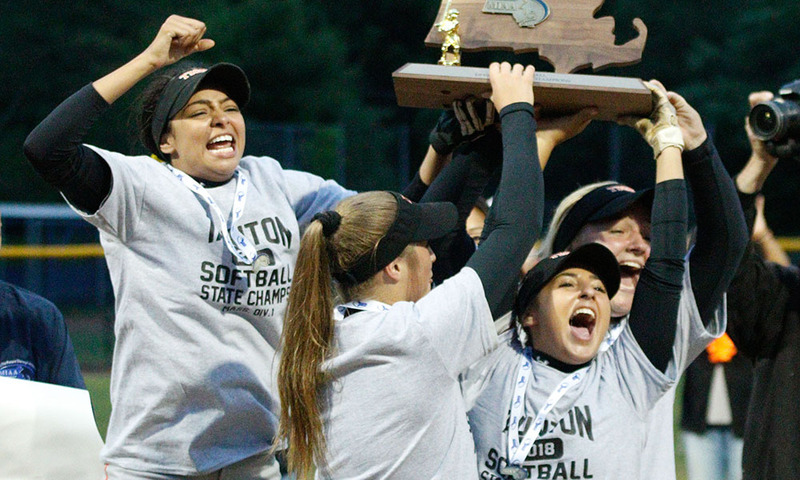 Stoughton threatened with the tying run at third in the sixth but North Attleboro denied the Black Knights. Karly Estremera led off with a walk and moved to second on a single from Baker. A short grounder allowed Estremera to take third and Baker moved to second. On the fourth pitch of the at-bat, Cangiano was able to block the ball down. It looked like it had gotten away from her and Estremera took off for home but Cangiano recovered nicely, grabbed the ball and made a diving play to tag the Black Knight base runner as she slid into home for an out. “Ashley did a great job on that play,” Wallace said. “I thought she could have had her the play before, the girl got caught leaning a little but I think it surprised Ashley a little bit. But I think that helped because then she was aware and felt like she could have gotten her, and then she did a great job blocking and tagging her. Baker retired the final six batters in order while Erti had a 1-2-3 seventh inning, including back-to-back strikeouts to end it. North Attleboro softball (1-0 overall, 1-0 Hockomock) is back in action on Monday when it entertains Oliver Ames. Stoughton (1-1, 1-1) has its first home game on Tuesday against Attleboro. Pitching will be a strength for the Panthers this year with seniors Jackie Cherry and Emily Valentino giving the team depth and different options in the circle. Throwing strikes will be the key for both and limiting opposition base runners. Behind the plate, Franklin has plenty of experience as well with seniors Ally Shea and Maggie Hobby both capable of stepping in and handling the pitchers as well as providing power at the plate. Senior Tara Hartnett will be back at shortstop and provides strong defense up the middle. Junior Anna Balkus will be in centerfield and will set the table for the offense as the lead-off hitter. Junior Maddie White will be at third base and joins Shea and senior Kylie-Jade Bouzan as the team’s primary run producers. King Philip, 14 @ Mansfield, 0 – Final (5 inn.) – King Philip’s offense exploded for 16 hits as a team with Meghan Gorman and Faith Turinese collecting three apiece. Sydney Phillips and Hailey McCasland (four RBI) each added two hits for the Warriors. Elise Pereira allowed just one hit in five innings of work, striking out nine. North Attleboro, 14 @ Foxboro, 0 – Final (5 inn.) 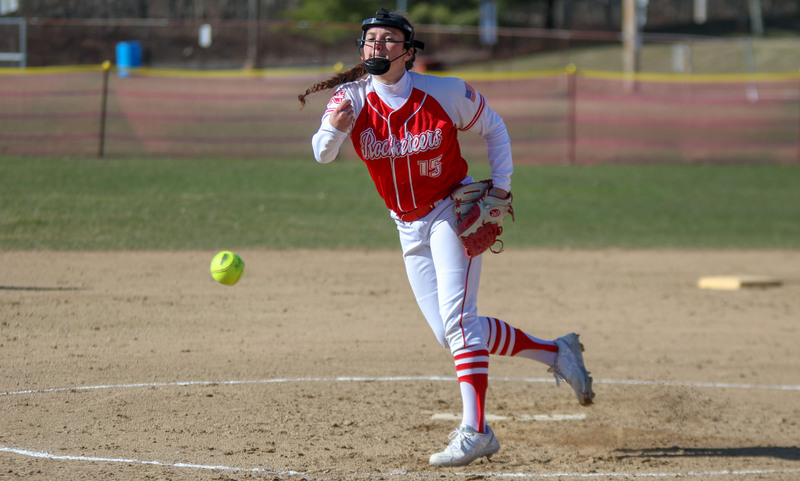 – North Attleboro sophomore Bella Ertia allowed just four hits, didn’t issue a walk, and struck out seven in the Rocketeers win on the road. Erti helped her own cause with a pair of hits, including a double, while Olivia Capobianco hit a home run, Ashley Cangiano had two doubles, and Annabelle Hebard added two hits. Katie Daby had a strong day at the plate, going 3-for-3, Andrea Miceli had a two-run double, and Emily Pastore had a hit and three runs scored. Milford, 28 @ Sharon, 2 – Final (5 inn.) – Emily Piergustavo went 3-for-3, including a grand slam, and scored four runs to lead the Hawks to a big win. Kate Irwin and Jess Tomaso each had three hits in the game, including a two-run home run each. Amanda Wenckus and Megan Hart each had their first varsity hit in the win. Jody Goldenberg scored one of Sharon’s runs and drove in the second. Attleboro, 0 @ Taunton, 5 – Final – Taunton didn’t lose a single game in its three single matches in a win over visiting Attleboro. Francois Hennaux (first singles), Brett Beaulieu (second singles), and Mike Briggs (third singles) all won 6-0, 6-0 for the Tigers. The team of Charlie Fiske and Dylan Kullas won 6-0, 6-1 at first doubles while Kyle Dennehy and Alex Pugh paired up for a 6-2, 6-2 win at second doubles. North Attleboro, 5 @ Foxboro, 0 – Final – North Attleboro won all five matches in straight sets to secure its 10th win of the season. Richard Bermudez won 6-1, 6-1 at first singles, Christian Bermudez earned a 6-0, 6-0 decision at second singles, and freshman Jonah Manso picked up a 6-2, 6-0 win at third singles. North’s first doubles team of Ben Pfeffer and Vikram Senthilakumaran prevailed 6-3, 7-5 while Sam Gallagher and Alex Pfeffer earned a 6-4, 6-0 win at second doubles. King Philip, 3 @ Franklin, 2 – Final – King Philip junior Marco DiStefano battled back from a one-set deficit, emerging with a 5-7, 6-1, 6-2 victory at first singles to help the Warriors edge Franklin in a battle of the top two teams in the Kelley-Rex. KP also picked up wins from Jack Cannon at third singles (6-4, 6-1) and the team of Nick Ihley and Aidan Ignatius at second doubles (4-6, 6-2, 6-3). Franklin freshman Liam Marr won 6-3, 7-6 (3) at second singles and Tyler DiPalma and Derek Wu prevailed 6-3, 6-2 at first doubles. Attleboro, 0 @ Canton, 5 – Final – Canton swept the visiting Bombardiers by winning all five matches in straight sets. Natalie Keppler won 6-1, 6-1 at first singles, Rachel Kupferman didn’t drop a single game in a 6-0, 6-0 win at second singles, and Sarah Hernandez picked up a 6-4, 6-2 win at third singles. Canton’s Caitlin Matthews and Stelina Michaelidis won 6-2, 6-2 at first doubles while Nyah Claiborne and Rose Hazam prevailed 7-5, 6-1 at second doubles for the Bulldogs. Foxboro, 4 @ North Attleboro, 1 – Final – Foxboro’s Sophia Prinos didn’t lose a game in a clean sweep at first singles, leading the Warriors to a win on the road. Freshman Pam Nelson added a 6-4, 6-0 win at second singles, the team of Sarah Prag and Julia Muise won 6-4, 6-2 at first doubles, and Olivia Dantona and Kendall Millender paired up to earn a 7-6 (3), 6-3 win at second doubles. North Attleboro’s Azka Siddiq won 6-3, 6-2 at third singles. Milford, 2 @ Mansfield, 3 – Final – Mansfield earned a pair of wins in singles play, and one more in doubles to edge Milford. Freshman Aryann Khosravani won 6-3, 6-2 at second singles and Sam Sternburg prevailed with a 6-1, 0-6, 7-6 (8-6) win at third singles. The team of Tessa Garufi and Hannah Podolske were ahead 4-0 in the first set before winning by forfeit. Milford’s Julie Rabinowitz won 6-2, 6-4 at first singles and the team of Megan Larouco and Angela Pillarella won 6-4, 6-3 at second doubles for the Hawks. Oliver Ames, 1 @ Taunton, 4 – Final – Taunton and Oliver Ames’ two doubles teams battled it out, with one going three sets, the other needing a tiebreaker, but the host Tigers prevailed in both. McKenzie Lucie and Samantha Martin rallied for a 0-6, 6-3, 6-2 win at first doubles, and Amanda Pugh and Brianna Fevrier emerged 7-5, 7-6 (3) at second doubles. Taunton also picked up wins at first singles from Jillian Pagliuca (6-0, 6-0) and second singles from Vanessa Rosa (7-6 (3), 6-4). Oliver Ames’ Maura Kiernan won 6-0, 6-2 at third singles. Canton, 90 @ Foxboro, 46 – Final – Canton’s Cordel Smith won three vents and Marquise Montes took first in two more to lead the Bulldogs to a win. Smith won the 200M (22.8), the high jump (5’11), and the long jump (19’8) while adding a second place finish in the 100M (11.5). Montes was first in the 100M (11.3) and the triple jump (39’9). Colin Messinger took first in the 2 Mile (10:33) and second in the 1 Mile (4:46.7), Riley McDonnell took first in the 400M hurdles (62.3) and third in the 400 (55.3), and Steven Brady was second in the triple jump (36’10”) and third in the 400M (55.3). Canton’s 4×100 relay team (Gersom Rivera, Junior Sainvil, Lucca Terenzio, Montes) and 4×400 relay team (Gerry Sullivan, Chris Milne, Steven Brady, Shane Graham) each placed first. Taunton, 31 @ Oliver Ames, 105 – Final – Oliver Ames’s Jack MacAdam took first place in four events to lead the host Tigers to a big win. MacAdam took first in the 400M hurdles, the 110M hurdles, the long jump, and the high jump. Other first-place finishes for OA included Jason Windvogel (1 Mile), Matt Campbell (400M), Ethan Eckstrom (800M), Kyle Sarney (2 Mile), Jack Mills (Shot Put), Quinn Proudley (discus, javelin), and Kalil Mater (triple jump). OA’s 4×100 (Jared Boone, Chucky Akanegbu, Aaron MacDonald, Kalil Matier) and 4×400 relay (Zane Reservitz, Ethan Eckstrom, Matt Campbell, Jason Windvogel) both placed first. King Philip, 33 @ Mansfield, 103 – Final – Mansfield’s Mike Shannon, Jareme DiLorenzo, and Kevin McCree all won a pair of events to help the Hornets score a big win over King Philip. Shannon won the 400M hurdles (57.56) and the 400M (50.7), DiLorenzo was first in the 110M hurdles (15.3) and the long jump (21’2.5″), and McCree won the shot put (44’10”) and the discus (120′ 5″). The Hornets also swept both relays with the 4×100 relay (Khristian Conner, Greg Waters, Colin Eutsay, Joe Cappelletti) and the 4×400 relay (Dan Knight, Tyler King, Jack Rivard, Nick Horn) each taking first. Canton, 70 @ Foxboro, 66 – Final – Canton freshmen Maddie Rousseau led the way with 18 points while Olivia Rodman notched 14 points in the Bulldogs win over Foxboro. Rousseau won three events, taking first in the 100M, qualifying for states in the 200M, and first in the long jump (15’4.25″) while taking second in the triple jump (31’3.5). Rodman won the 400M (64) and the triple jump (31’6″) while taking second in the 400M hurdles and third in the long jump. Sarah Collins added two wins (400M hurdles and 800M) while Bronwyn Mahoney won the shot put (31’10”) and discus (74’4″). King Philip, 56 @ Mansfield, 80 – Final – Mansfield celebrated Senior Day on Tuesday afternoon, with seniors Julia Harrison and Madison Haughey winning their final matches on the Mansfield High track. Harrison won the 100M and was a member of the winning 4×100 team while also taking second in the long jump. Haughey won the 100M hurdles, took second in the triple jump, and placed third in the high jump. Freshman Tessa Lancaster ran a 13-second PR in the mile to take first (5:38.5), junior Amanda Mangano was a two-time winner (200M, long jump), and junior Julia Hill had a 1’3″ PR in the triple jump to take first. Joining Harrison on the winning 4×100 relay team was Gabrielle Devlin, Emily Quitzau, and Samantha Hindman. Attleboro, 2 @ Milford, 3 – Final (8 Inn.) – Milford junior Nick Marcolini earned the win on the mound and scored the game-winning run as the Hawks took down visiting Attleboro in extra innings. Marcolini led off the eighth with a walk, stole second, and advanced to third. He came in to score the winning run on a sacrifice fly from Colby Pires. In a relief appearance, Marcolini tossed three scoreless innings with two strikeouts to get the win. Luke Rosa was the starter for Milford, allowing two runs in five innings with four strikeouts. Matt Swanson added two hits, including a double and a run scored, for the Hawks. Oliver Ames, 13 @ Foxboro, 4 – Final – Foxboro held a 4-2 lead after an inning of play but OA chipped away and used five runs in the third inning to seize an 8-4 lead and never looked back. Jack Erlich went 3-for-3 with three runs and two RBI and Mitch Goulet had three hits, including a pair of doubles, and four RBI. Nick Zwerle and Tom Parker combined for 6.1 innings of scoreless relief for the Tigers. Foxboro’s Chad Bearce was 2-for-4 with a triple while Joe Cavaleri and JT Burke each drove in a pair of runs. Taunton, 7 @ Canton, 0 – Final – Taunton’s Trevor Pietrzyk (two doubles, triple) set the tone, going 3-for-4 from the leadoff spot with an RBI and a run scored as the Tigers notched a win on the road. Jakob Roberts added two hits and two RBI while Ben Joyce drove in a pair of runs. Tyler Medeiros and Jacob Crawford each had a hit, an RBI and two runs scored for the Tigers. Medeiros got the win on the mound, scattering three hits over five innings of work with five strikeouts. Brendan Bignar and Logan Lawrence each tossed a scoreless inning in relief. Franklin, 14 @ Stoughton, 10 – Final – Franklin scored five runs in the top of the seventh inning to break a 9-9 tie and emerge from Stoughton with a win on the road. JB Flores went 4-for-4, including a double and an RBI while scoring a pair of runs. Evan Wendell also had a strong day for Franklin with a pair of doubles, runs scored and four RBI. Jake Macchi added three hits and three RBI for Franklin while both Scott Elliott and Colby Fitzgibbons had two RBI apiece. Ben Guzman got the win in relief, allowing three hits and one run over three innings of work. Stoughton’s Matt Hadley and James Genest both went 3-for-4 with two RBI and a run scored while Geroge Currier and Cian Swierzewski each drove in two runs for the Black Knights. King Philip, 8 @ Sharon, 4 – Final – King Philip tied the game in the fifth, took the lead in the sixth, and then tacked on three insurance runs in the seventh inning to complete a comeback from at Sharon. KP took a 3-0 lead in the second before Sharon pulled ahead with four runs in the third. Pat Limerick had three hits and one RBI, sophomore Chris Sawyer had two hits and two RBI, and Tyler Nault delivered with an RBI pinch-hit single for the Warriors. Terry Murray earned the win in relief, throwing three scoreless innings with one strikeout. Mansfield, 3 @ North Attleboro, 1 – Final – Mansfield senior Kevin Dow had a dominating performance on the mound, throwing a complete game with just two hits allowed and no walked and one unearned run allowed to lead the Hornets to a win over previously unbeaten North Attleboro. Dow struck out nine and didn’t issue a walk to get the win. Offensively, Dow went 2-for-4 and had an RBI triple in the third inning that put Mansfield up 2-0. Dow then scored on an RBI single from senior Tyler Dalton. Mansfield took the lead in the top of the second when Cullin Anastasia scored. Zach DeMattio and Brendan McHugh (run) each had a hit for Big Red. Milford, 12 @ Attleboro, 3 – Final – Milford plated six runs in the sixth inning to break open what was a two-run game to grab a win on the road. The Hawks took a 5-3 advantage into the sixth before exploding for six runs. Jess Tomaso (2-for-4, three RBI) hit a home run in the sixth for her 100th career hit. Emily Piergustavo added two hits, two runs, and four RBI, Maddy Bonvino went 3-for-4 with a double, triple, and two-run home run and Kate Irwin had three hits, three runs, and an RBI for the Scarlet Hawks. Kelley Reichert got the win in the circle, striking out nine. Attleboro leadoff hitter Jordyn Lako went 4-for-4 with two runs scored and MacKenzie Killough blasted a two-run home run in the third inning. Canton, 0 @ Taunton, 13 – Final (5 Inn.) – Taunton sophomore Jaylin Couto struck out 10 while allowing just two hits and one walk to help the Tigers notch a win over visiting Canton. Couto improved to 3-0 with five scoreless innings. Offensively, Kelsey White went 3-for-4 with three runs, two RBI, and a stolen base, Kya Enos had two hits including a double, a run scored and an RBI, Abbie McDonough recorded two hits, scored three runs, stole a base, and had an RBI, and freshman McKenzie McAloon drove in three runs for the Tigers. Foxboro, 4 @ Oliver Ames, 3 – Final – Foxboro senior Mandy Ryan had an RBI single in the top of the seventh to help the Warriors come up with a win on the road. Hannah Davis and Chelsea Gibbons each had two hits while Emma Rohan earned the win in the circle, striking out four. Oliver Ames’ Caroline Mahoney went 2-for-4 with RBI, Katie Mills was 2-for-3 with an RBI, Marissa Guarino had two hits and an RBI, and Alexis Campbell had two hits and a run scored for OA. Freshman Emma Varella pitched a complete game for OA, striking out three. North Attleboro, 7 @ Mansfield, 1 – Final – North Attleboro broke open a two-run game with four runs in the last two innings to make it two wins in two days for the Rocketeers. Bella Erti struck out 11, allowing only four hits and no walks to pick up the win. Abby Warren and Olivia Capobianco paced the North offense with three hits apiece, while Ashley Cangiano and Katie Daby each had two hits. Katherine Munley came through with a couple of nice grabs in the field, according to North coach Bill Wallace, and Cangiano threw out her third runner attempting to steal in two days. Mary Muldoon drove in the lone Mansfield run in the second, singling in Caty DeMassi. Kara Bendanillo went 2-for-3 for the Hornets. Canton, 11 @ Attleboro, 4 – Final – Canton raced out to a 5-1 lead at half time and never looked back to beat Attleboro. The Bulldogs, who never trailed in the game, had seven different goal scorers including senior Joey Vaughan. Mansfield, 9 @ Oliver Ames, 12 – Final – OA goalie Nick Gillis had a huge game in the cage and Frankie Ireland netted three goals to help the Tigers score a big win over Mansfield. Eric LeBlanc and Sam Stevens added two goals each in the win. Milford, 3 @ North Attleboro, 17 – Final – For Milford, Josh Ligor, Andrew Gallagher, and Mike Demko each scored once while Cullen Burns recorded an assist. Attleboro, 6 @ Canton, 15 – Final – Caroline Tourgee had four goals, Molly Colburn scored three goals and had a pair of assists, and Maggie Connolly had two goals and four assists for the Bulldogs. Leah McClellan and Kaitlyn Goyetch each added two goals and an assist, while Alexa Maffeo scored once and had a pair of helpers. Rachel Beatty scored once for Canton and Vicky Revanche made 12 saves in the Bulldogs net. Taunton, 2 @ King Philip, 19 – Final – KP used nine different goal scorers to put an end to it two-game losing streak. Alli Meehan (one assist), Caroline Klim, Mackenzie Mazur, and Ali Wilson all recorded hat tricks for the Warriors, while Jess Sullivan scored a pair. Izzy Agricola, Jenna Hitchen (one assist), Olivia Tormey, and Dana Truini also scored for KP. Sharon, 8 @ Foxboro, 19 – Final – Sabrina Robbins and Emma Eberhardt both had hat tricks for Sharon in the loss. Robbins added eight draw controls, while Eberhardt also had two assists and four draw controls. Maxine Gordon and Abbi Solomon scored the other goals for the Eagles and Taylor Kim scooped four ground balls. Oliver Ames, 9 @ Mansfield, 19 – Final – The Hornets won for the second time in three days to get back to .500 on the season and move into a third-place tie with OA in the Kelley-Rex division. Mansfield had six different goal scorers in the game, led by Katy Garvin’s six and Maggie Danehy’s four. Hannah Sternburg made six saves in the Mansfield goal. North Attleboro, 15 @ Milford, 2 – Final – North Attleboro had its passing game working on Wednesday, getting an assist on all 15 of its goals. Freshman Maggie O’Brien notched her first varsity goal in the win and also had four assists on the day. Julia Tolfa chipped in with six draw controls for the Rocketeers. Milford, 2 @ Attleboro, 3 – Final – Attleboro swept doubles play and picked up one win in singles to get a win over visiting Milford. Jared Cooper won 6-3, 6-1 at third singles while the team of Ryan Gordon and Estrada won 6-1, 6-1 at first doubles and Luis Sandoval and Eli Araujo didn’t lose a game in a 6-0, 6-0 win at second doubles. Milford’s Brendan Shaughnessy won 6-3, 6-3 at first singles and classmate Cam Doherty took a 7-5, 6-3 decision at second singles. Canton, 0 @ Taunton, 5 – Final – Taunton picked up its second straight win by sweeping visiting Sharon, taking all three singles matches in straight sets without dropping a game. Francois Hennaux (first singles), Brett Beaulieu (second singles) and Mike Briggs (third singles) all won 6-0, 6-0. The team of Charlie Fiske and Dylan Kulas won 6-3, 6-2 at first doubles while Kyle Dennehy and Alex Pugh prevailed 5-7, 6-4, 10-1 at second doubles. Stoughton, 0 @ Franklin, 5 – Final – Franklin’s doubles teams combined to drop just one game total in a sweep over visiting Stoughton. Tony Calderone and Derek Wu won 6-0, 6-0 at first doubles while Shournik Sompally and Saket Gandham won 6-0, 6-1 at second doubles. Rohan Herur won 7-5, 6-3 at first singles, Liam Marr dropped just two games in a 6-0, 6-2 win at second singles, and Tyler DiPalma won 6-0, 6-1 at third singles. Sharon, 3 @ King Philip, 2 – Final – King Philip pushed Sharon to the edge but the Eagles prevailed, keeping their lengthy league win streak alive. Senior Andre Olivei won 6-2, 0-6, 6-4 at first singles and sophomore Alberto Olivei recorded a 6-2, 6-3 win at third singles. Sharon’s third win came from Ashwin Sreevatsa and Arie Chinnappan, who won 6-4, 6-2 at second doubles. King Philip’s Nick Putney won 6-1, 5-7, 7-6 (4) at second singles and the team of Sean Desrochers and Nate Ihley picked up a 6-3, 6-7 (3), 7-6 (4) win at first doubles. North Attleboro, 4 @ Mansfield, 1 – Final – North Attleboro swept singles play in straight sets and took another win in doubles play to record a win on the road at Mansfield. Richard Bermudez won 6-1, 6-1 at first singles, Christian Bermudez notched a 6-2, 6-0 win at second singles and freshman Jonah Manso took care of business with a 6-1, 6-0 win at third singles. North’s second doubles teams of Alex Pfeffer and Sam Gallagher won 6-4, 6-4 at second doubles. Mansfield’s Jalaj Singh and Sethu Odayappan won 6-3, 7-5 at first doubles. Taunton, 3 @ Canton, 2 – Final – Taunton’s first doubles pairing of McKenzie Lucie and Samantha Martin overcame a one-set deficit to record the third and final point to help the Tigers beat Canton. Lucie and Martin won 4-6, 6-0, 6-2 while Taunton’s second doubles team of Amanda Pugh and Brianna Fevrier won 6-0, 6-3 at second doubles. Freshman Jocelyn Pagliuca won 6-4, 6-3 at third singles for Taunton. Canton freshman Natalie Keppler won 6-1, 6-0 at first singles and classmate Rachel Kupferman didn’t lose a game in a 6-0, 6-0 win at second singles. Oliver Ames, 0 @ Foxboro, 5 – Final – Foxboro’s Sophia Prinos and Pamela Nelson won their singles matches in straight sets to help the Warriors earn a victory. Prinos won 6-1, 6-0 at first singles, Nelson notched a 6-0, 6-0 win at second singles, and Kayla Prag emerged with a 6-2, 4-6, 10-4 win at third singles. The Warriors’ team of Sarah Prag and Julia Muise won 6-1, 5-7, 11-9 while Olivia Dantona and Kendall Millender recorded a 6-1, 6-4 win at second doubles. King Philip, 1 @ Sharon, 4 – Final – Sharon picked up a pair of wins in singles play and two more in doubles to get a win over King Philip. Nupur Shukla won 6-0, 6-1 at first singles while Lulu Yuan emerged with a 6-1, 6-2 win at second singles. Katie Merport and Emily Wen won 6-2, 6-1 at first singles and Sophia Fein and Rithika Neti recorded a 6-4, 6-3 win at second doubles. Mansfield, 1 @ North Attleboro, 4 – Final – North Attleboro swept singles play, taking all three matches in straight sets, to defend home court against Mansfield. Jordan Willis won 6-1, 6-1 at first singles, Emily Chiasson took a 6-4, 6-0 decision at second singles, and Azka Siddiq didn’t lose a game in a win at third singles. North’s team of Leah Marceau and Tara Nair won 6-2, 6-1 at second doubles. Mansfield’s first doubles team of Tessa Garufi and Hannah Podolske won 5-7, 6-4, 10-7 for the Hornets. Taunton, 3 @ New Bedford, 0 – Final – Taunton went on the road and returned with a 3-0 (25-13, 25-17, 25-17) win over New Bedford. Lens Esquil notched 11 kills and four blocks, Collin Hunter added five kills and four blocks, Malik Charles chipped in with four kills and a pair of blocks, and Alex Tavares notched four kills and a block. Freshman Tyler Stewart recorded his first two career kills in the win. Milford, 2 @ Canton, 3 – Final – Canton senior Robbie Wilkinson allowed just two runs on five hits in 6.1 innings of work and added an RBI on offense to help the Bulldogs edge the Hawks. Milford loaded the bases in the top of the seventh against reliever Paul Cocoran but the junior got the final two outs to escape the jam. Wilkinson had an RBI double in the third while Jake Aronson had two doubles and an RBI for the Bulldogs. Aidan Wilde went 2-for-3 with a double and a walk for the Hawks while sophomore Luke Rosa allowed just one earned run in five innings of work, striking out four. Taunton, 2 @ Franklin, 0 – Final – Click here for a Recap and Photo Gallery from this game. Mansfield, 6 vs. Bishop Feehan, 1 – Final – Mansfield broke open a tie game with a five-run sixth inning to beat Bishop Feehan. The Shamrocks had a total of just two hits and no walks but plated the first run in the first inning. The Hornets tied the game in the top of the third and then pulled away in the sixth. Sam Nugent and Kevin Dow each had two hits and scored a run for the Hornets while pinch hitter Jake Gerraughty knocked in a pair of runs. Connor Sheehan earned the win on the mound, striking out eight with just two hits in six innings of work. Sophomore John Carney struck out one in a 1-2-3 seventh inning. Oliver Ames, 6 @ Stoughton, 1 – Final – Oliver Ames pushed across four runs in the top of the third inning and tacked on solo runs in each the fourth and seventh innings to beat Stoughton. Michael Friel went 3-for-3 with an RBI while Reid Latham struck out five and allowed six hits in six innings of work to get the win. Stoughton’s Ruben Gonzalez allowed just one earned run in three-plus innings of work and went 3-for-4 at the plate. Attleboro, 5 @ Mansfield, 4 – Final – Attleboro took a 2-0 lead with single runs in the first and the third innings but Mansfield scored three in its half of the third to jump in front. Sarah Cahill, who struck out three in six innings in the circle, led off with a single and scored on a base hit by Kara Bendanillo. Mady Bendanillo made it 3-2 with a two-run homer. Attleboro rallied with a pair of runs in the fifth to get the lead back and then added the eventual game-winner in the sixth. The Hornets got within one in the sixth after Mady Bendanillo (3-for-3) tripled and was brought in by Caty DeMassi, but couldn’t find another run. Mansfield coach Lori Letendre called it a “good back and forth game” and said the Hornets had chances late but “couldn’t come up with the timely hit we needed.” Freshman Ashlyn Conley went 2-for-3 in her varsity debut for Mansfield. Milford, 19 @ Canton, 6 – Final (6 inn.) – Milford scored 10 runs in the top of the second inning to earn a big win on the road at Canton. Sabrina Haarstick (three-run), Jess Tomaso (3-for-5, triple five RBI), and Maddy Bonvino (3-for-4, three RBI, three runs) each had a home run in the win for the Hawks. Shannon Cormier added two hits and four runs, Emily Piergustavo reached base four times and scored four runs, and Kate Irwin (2-for-4) had a double, stolen base, and three runs scored. Kelley Reichert struck out eight with one hit allowed in three innings of work in a relief appearance. North Attleboro, 4 vs. Dartmouth, 2 – Final – Bella Erti allowed three hits and one walk, while striking out one to pick up the win for North. Katie Daby (2-for-3) broke a 2-2 tie in the fourth inning with a solo homer and North added a fourth run in the following inning when Abby Gallagher scored on an Erti fielder’s choice. Katherine Munley and Gallagher each made nice catches in the outfield, according to North coach Bill Wallace, and Olivia Capobianco robbed Dartmouth of a homer in the seventh that would have cut the lead to one. Sharon, 0 @ Taunton, 17 – Final (5 inn.) – Alexa and Kelsey White combined to strike out 10 batters with three hits allowed and no walks in five innings of work to lead Taunton to a win. Alexa struck out eight, scattering three hits in four innings of work to get the win. Kelsey struck out two of the three she faced in the fifth inning. Offensively, Alexa White went 3-for-3 with a triple and a pair of doubles, knocking in three runs. Mackenzie Handrahan had three hits, including a home run, and four RBI while Kya Enos (2-for-3) and Abbie McDonough (2-for-3) each had a double and two RBI. Franklin, 11 vs. Bishop Feehan, 4 – Final – Click here for a Recap from this game. King Philip, 13 @ Sharon, 5 – Final – KP used seven different goal scorers and allowed only one goal in the second half (head coach Kourtnie Wilder described it as a “huge defensive effort!”) to pull out the non-league victory. Caroline Klim was the top scorer for the Warriors with five goals. Jess Sullivan and Lauren Anderson each tallied twice, while Alli Meehan (five draw controls), Olivia Tormey, Mackenzie Mazur and Dana Truini (four draw controls) each had one for KP. Shayla Weirzman had an assist. The Warriors also got 13 saves from Caroline Watson. Abbi Solomon and Sabrina Robbins each scored a pair of goals and Emma Eberhardt scored a goal, had a pair of assists, and five draw controls for the Eagles. Mansfield, 16 @ Oliver Ames, 13 – Final – Ann Maher scored six goals to pace the Hornets, including the game-winner with just over two minutes remaining. Coming out of a timeout in a tie game (13-13), Maher scored her fifth goal of the game to give Mansfield the lead for good. Katy Garvin and Maher each added another goal in the closing minutes to seal the win. Olivia Murray had a hat trick for the Hornets, while Hayleigh Crawford, Lauren Whitman, and Garvin each scored twice. Hannah Sternburg made 14 saves in the win. Franklin, 5 @ Taunton, 0 – Final – Franklin continued its perfect start with a sweep on the road at Taunton. Rohan Herur won a battle at first singles, emerging with a 7-5, 6-4 win while Liam Marr (6-2, 6-0) and Saketh Saripalli (6-0, 6-0) also picked up wins to sweep singles play. The team of Tyler DiPalma and Derek Wu won 6-1, 6-1 at first doubles while Tony Calderone and Dan Angermeier didn’t lose a game in a 6-0, 6-0 win at second doubles. Stoughton, 3 @ Oliver Ames, 2 – Final – Stoughton junior Erik Anderson stepped into the first singles spot and picked up a 6-2, 6-2 win, helping the Black Knights edge neighboring Oliver Ames. Hassan Khan added 6-3, 7-5 win at third singles and Brendon Buckley and Mike Veliotis notched a 6-1, 6-2 win at second doubles. Oliver Ames’ Henry Simone won 6-1, 6-1 at second singles and the team of TJ Clifford and Liam McMorrow rallied for a 4-6, 6-4, 6-3 win at first doubles. Mansfield @ Attleboro – Postponed to a date and time to be announced. Milford, 1 @ Canton, 4 – Final – Canton swept doubles play and picked up two more wins in singles to earn a victory over visiting Milford. Rachel Kupferman didn’t drop a game in a 6-0, 6-0 win at second singles and Sarah Hernandez won 6-0, 6-2 at third singles. The team of Jena Moyle and Stelina Michaelidis picked up a 6-0, 6-2 win at first doubles and Canton’s pairing of Caitlin Matthews and Sophie Le earned a 6-3, 6-2 win at second doubles. Milford’s Julie Rabinowitz won 7-5, 6-4 at first singles. Taunton, 5 @ Franklin, 0 – Final – Taunton dropped just two games total in four matches to get a win on the road. Jillian Pagliuca won 6-0, 6-0 at first singles, Vanessa Rosa picked up a 6-0, 6-2 win at second singles, and Jocelyn Pagliuca won by forfeit at third singles. Samantha Martin and McKenzie Lucie (first singles) and the team of Amanda Pugh and Kayla Parrett (second doubles) both won without losing a game. Stoughton, 0 @ Oliver Ames, 5 – Final – OA sophomore Sarah Barron made her varsity debut at third singles and came away with a 6-1, 6-1 win to help the Tigers sweep Stoughton. Sarah Leger picked up a 6-2, 6-0 win at first singles and Tate Hadges won 6-2, 6-0 at second singles. OA’s pairing of Kristin Bloumbas and Emily Yu won 6-4, 6-3 at first doubles and Olivia Groebe and Rachel Stryke paired up for a 6-1, 6-3 win at second doubles.